Washington State is phasing in mandatory boater safety education for everyone until the year 2014. The BoaterExam Washington Boating Safety Course & Boater Education Card Test meets the state's education requirements and allows boaters to get certified online. Boating Safety Legislation is expected to reduce boating-related fatalities. For the 2010 boating season, all boaters in Washington who are 30 years of age and younger must take a boating safety course and obtain the Washington Boater Education Card, often mistakenly referred to as the Washington Boat License or Washington Boating License. BoaterExam.com, an industry leader in outdoor education, offers an Online Boater Safety Course and Washington Boater Education Card Test] that meets this requirement. By the year 2014, all boaters in Washington State who were born after Jan 1, 1955 will need a boat license to operate a watercraft on state waterways. The Washington State Parks & Recreation Commission is phasing in this legislation, adding a new age group every boating season. It is believed that this boating safety legislation will help reduce the number of boating accidents and boating related fatalities. "We're excited to see Washington taking this step" says Kerry Moher, V.P. of Business Development with BoaterExam.com, "More operators with a boat license should help make Washington's waters safer." The online boating course is recognized by the U.S. Coast Guard, and approved by the National Association of State Boating Law Administrators (NASBLA) and the Washington State Parks & Recreation Commission. In an attempt to target all learning styles, the Washington Boating Safety Study Guide is fully narrated, contains interactive flash-based exercises, over 150 animated videos and visuals in every test question. "Our students love that they can sit back and learn about safe boating in an interactive environment," says Moher, "the course engages students of all ages and learning styles." The Washington State Boater Education Card is NOT a 'Washington Boating License’, is good for life and does not need to be renewed. 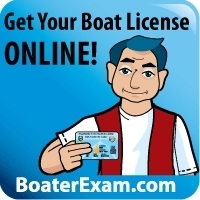 After passing the online safe boating course, a one-time payment of $39.95 is made to BoaterExam for the course and permanent boater education card. Temporary licenses are also available for print online, allowing boaters to get on the water right away.